One of my holiday gifts from SP was a set of two copper mugs. I've been wanting to use them for the past 2 weeks and this past Sunday was the day! We made Kentucky Mules for our Sunday afternoon cocktail. Ideally we would have had fresh mint, too, but that won't happen until May or June. Also ideally our lime would have been fresh and green instead of old, slightly brown, and slightly shriveled. That's why there's not a wedge or twist of peel on our cocktail! This was really tasty. 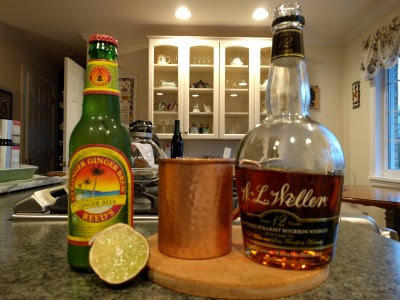 Be sure to use a bourbon you like and a good ginger beer. The ginger beer we used (Reed's Stronger Ginger Beer) was much more spicy gingery than the ginger beer we used to buy so we both liked it a lot more. It didn't taste simply like "fancy" ginger ale. Measure 1.5 oz bourbon and squeeze half a lime into cocktail shaker filled with some ice. You don't need to do this, but I wanted my bourbon cold. Really cold. 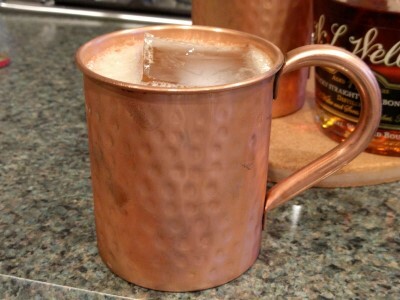 You could just measure the bourbon and lime juice directly into the copper mug and then not have to wash the shaker. 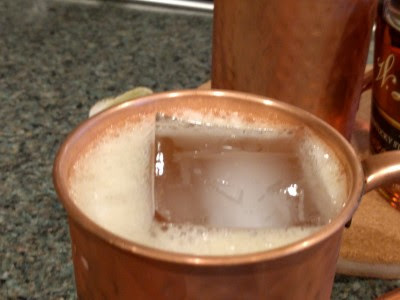 Shake, strain into copper mug filled with crushed ice or 2 large cubes. Pour desired amount of ginger beer on top. Ideally, garnish with fresh mint &/or lime wedge/wheel/peel twist. Enjoy!